I hadn’t been back to Big Bear, CA since I was about 12 years old, but I recently became obsessed with the idea of having a cabin there. I remember the lake and the skiing and now that I have my son James, I wanted to create a cozy home away from home we could call our own. 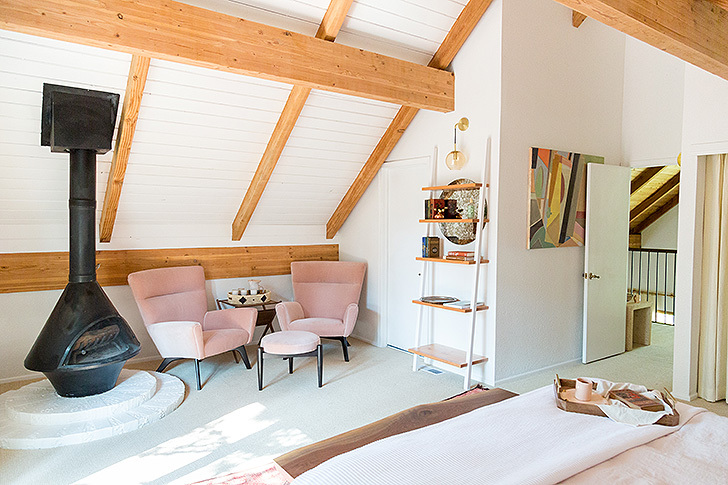 My husband Craig and I came across a 1970s Chalet style A-frame in the Moonridge area and immediately fell in love. It’s 10 minutes from the slopes and nestled on a quiet street with a large, tree-dotted lot. It has room for my full vision of an Apres-ski family weekend: late mornings sleeping in with the master bedroom fireplace going, puzzles and cards being played under the soaring A-frame ceiling, hot cocoa or fondue bubbling in the open kitchen and a crackling fire pit outdoors for s’mores in the summer or a cozy moment with hot toddies and piles of blankets. The house happily sleeps 8-10, so it’s perfect for my friends and their growing families to join the fun. As an introvert who also loves big family weekends, I wanted to have spaces for everyone to spread out. So, if you want to have a group play cards while someone else (like me) wants to quietly read in a corner, you don’t have to overlap too much. Plus, now that I have a kid, I totally get the appeal of corralling a bunch of them into a playroom so the adults can get a little peace. For each common space, I wanted there to be a clear focus to sort of guide the activity happening there. In the living room, it’s the fireplace; in the game room, it’s a vintage poker table; the backyard has a sunken dining room and another fireplace. Every space encourages gathering around something. The master bedroom is what made us buy the cabin. 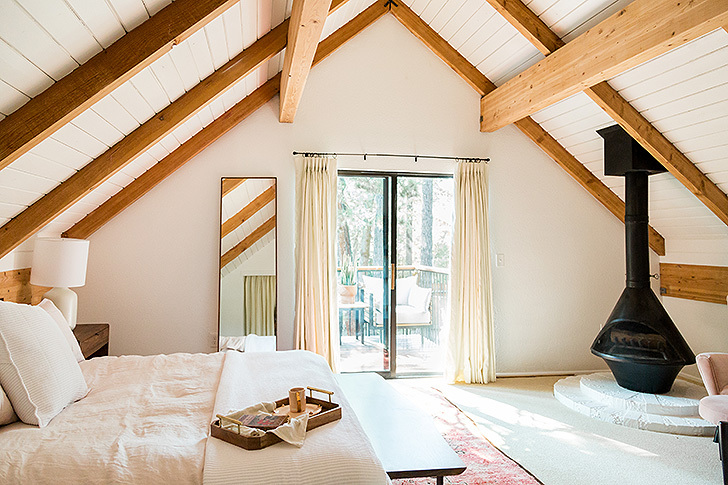 Tucked upstairs, it has soaring A-frame ceilings and a vintage wood burning fireplace. There’s a roomy balcony that had me daydreaming about cups of cocoa at tree height during the wintertime. But, it was dark and the bathroom was insane. Seriously. 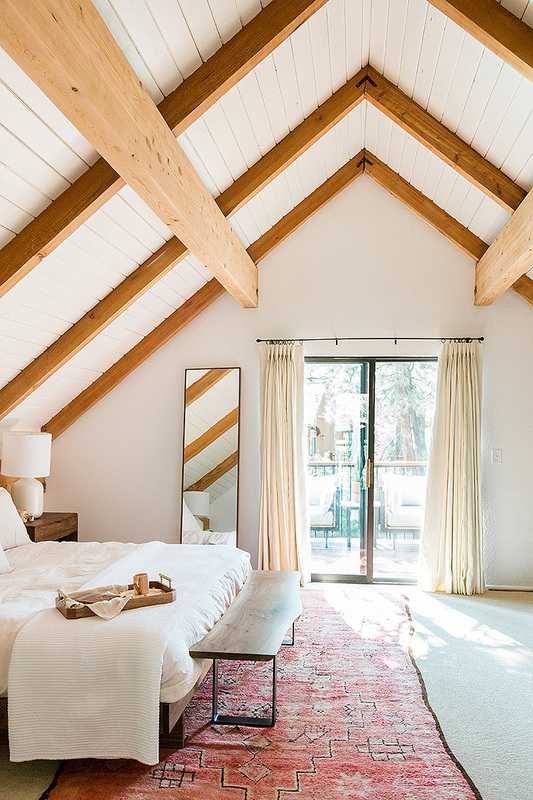 The ceiling was a grand 6’8” high and the mirror was a six-inch strip running like a backsplash along the sink, on the sloping side of the A-frame. This was not a bathroom built for a woman. Hunched over, best guessing my makeup is not my favorite first-thing-in-the-morning posture. 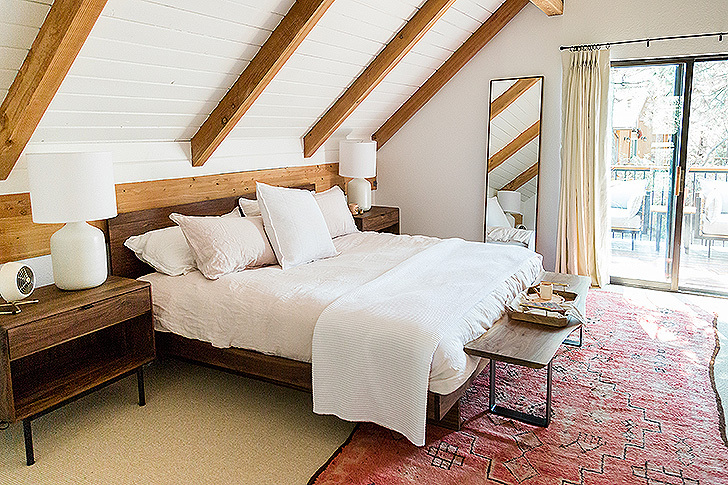 I wanted every aspect of the master suite to be rejuvenating – a special escape in the mountains. The first thing I needed to do was paint the ceiling. I wanted it to be light and airy, so I painted it a bright, fresh white. The ceiling, especially at this dramatic angle, bounces light around the space, almost as if you added a window. But I didn’t want to lose the cabin look, so I kept the beams in their natural wood tone. We discovered the bathroom could be any ceiling height we liked so we pushed it all the way up to the beams – a glorious 10 feet high. I removed the mirrored closet doors and added simple drapes. 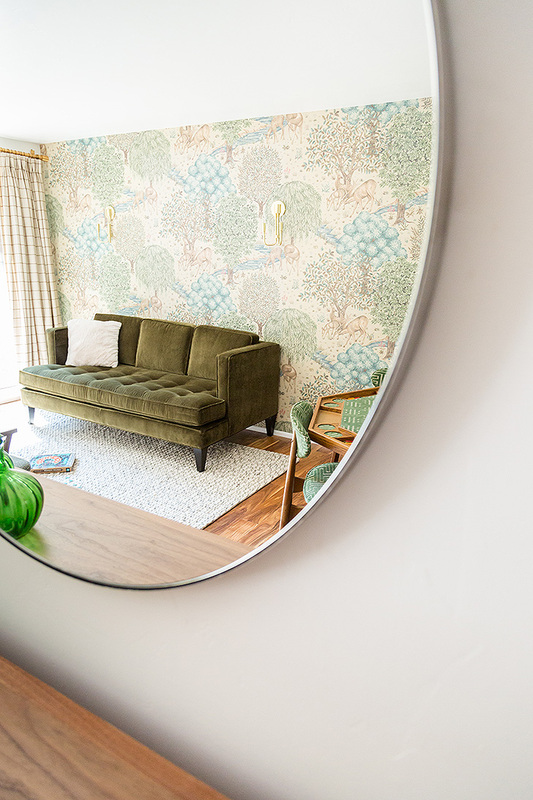 For the furniture, I wanted to continue the mid-century fun from downstairs but with a bit more elegance. The master bedroom is meant to be a retreat, a room for lazy hours, and I wanted the furniture to reflect that. The core piece is the bed and honestly, this is my favorite bed ever. It’s the most comfortable thing I’ve ever laid my head on. 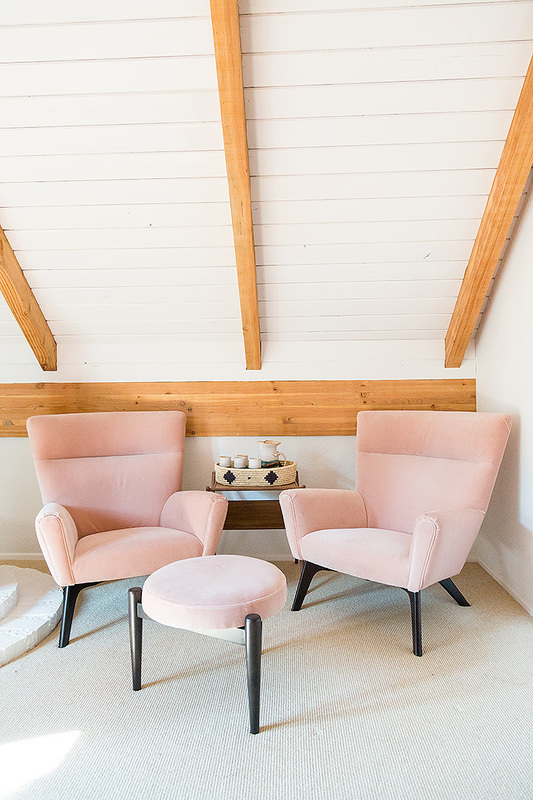 I wanted something elegant and soothing, but still with a pop of color, so I added the high backed Boden Chairs in Vance rose with a little Murphy ottoman. 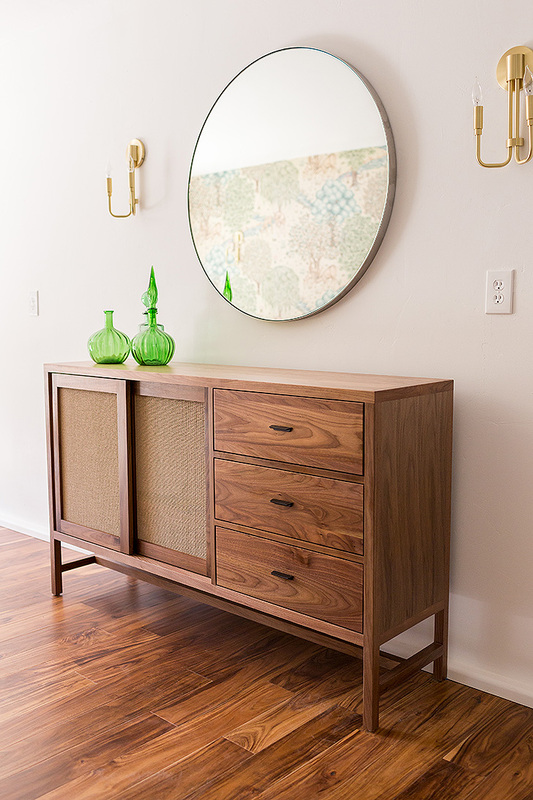 Next to the Anton Bed and Hensley nightstands, there’s a nice blend of clean lines and soft, cozy textures. I added a faded red rug to anchor the whole room and hung a large abstract painting by Sabina Yannone to carry the color palette through the front of the room. Going through the hallway, we’re now in the game room – which might be one of my favorite spaces in the house. 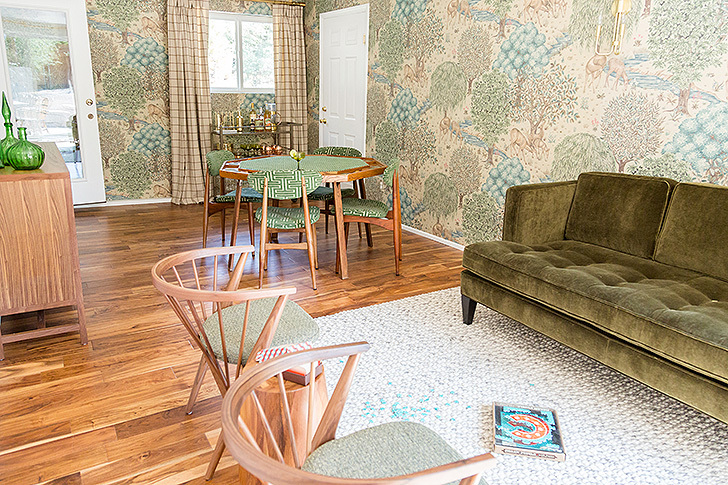 Every time I post a photo of this gorgeous W Morris wallpaper, I get so many comments asking about it. It adds so much to the room, and I especially love it with the elegant furniture throughout. I love all of the textures and colors, and can’t wait to sit in there during the wintertime. I felt like an epic bar cart needed to make an appearance somewhere, and the den-like quality of the game room felt like just the place. 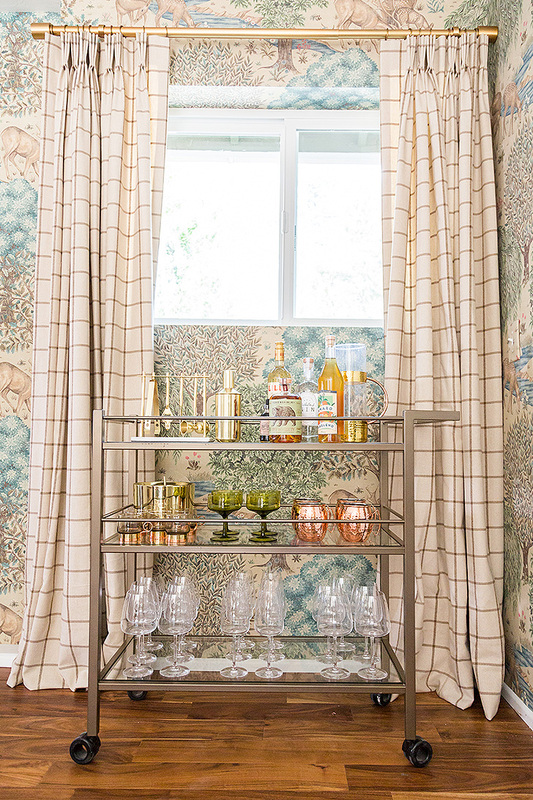 I used the Brixton bar cart and filled it with some of my favorite vintage pieces. The copper Moscow mule mugs are necessary for a cabin weekend. I love the cozy textures and modern lines Room & Board’s furniture and decor have brought to the cabin. The bedroom is airy and light, while the game room is the perfect space to hibernate over a cocktail and board game. 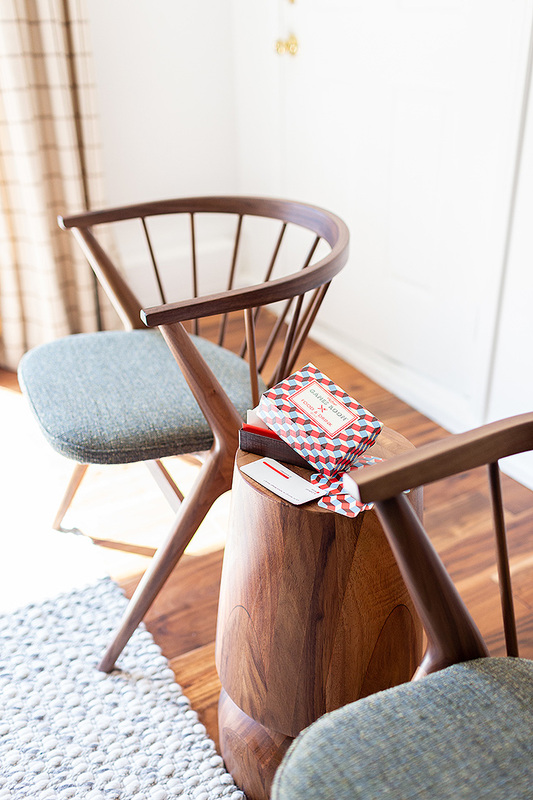 The Room & Board product featured in this post was gifted to Claire Thomas. All opinions are her own.